The following four books served as source material to construct the Norman Osborn timeline. This one shot features a detailed look into Norman's psyche as he composes yet another one of his infamous journals, this one filled with the escapades of his European exile. 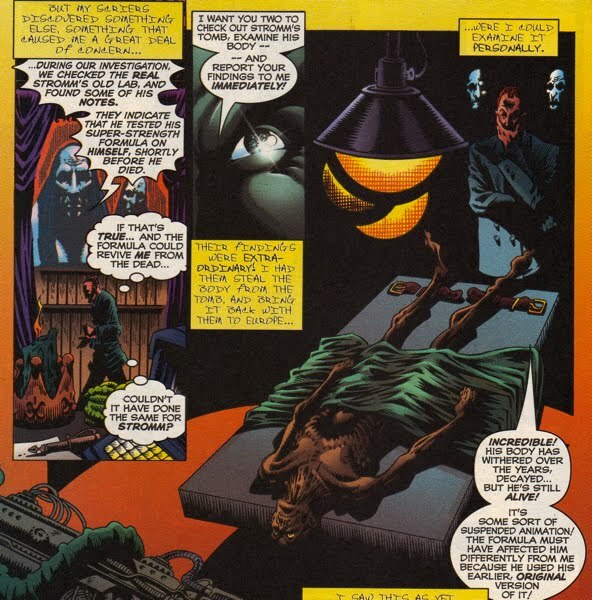 The story within Spider-Man: The Osborn Journal takes place the night before Norman returns into Peter's life in Peter Parker Spider-Man #75. In his journal, Norman describes precise time frames for four major events. 1. Nineteen years before Peter Parker Spider-Man #75, Stromm was sent to prison after Norman framed him for embezzlement. 2. Seven years before Peter Parker Spider-Man #75, Gwen Stacy died at the Brooklyn Bridge at the hands of the Green Goblin. 3. 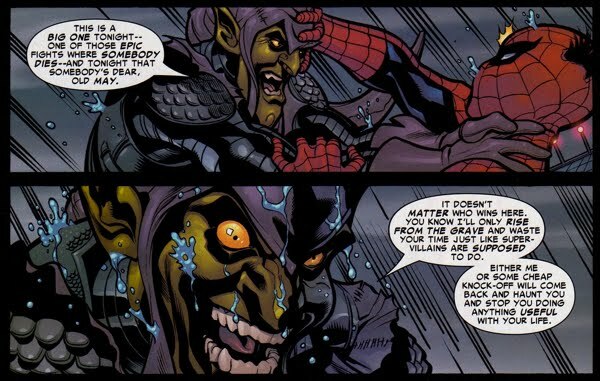 Four years after Amazing Spider-Man #122, The Hobgoblin first appeared. 4. 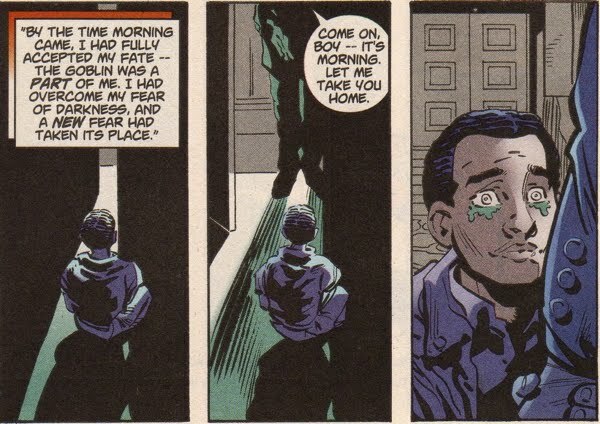 One year before Peter Parker Spider-Man #75, Harry Osborn 'died' due to his exposure to a toxic version of the Goblin Formula. A second source for Norman's timeline is Amazing Spider-Man #37 (June 1966). 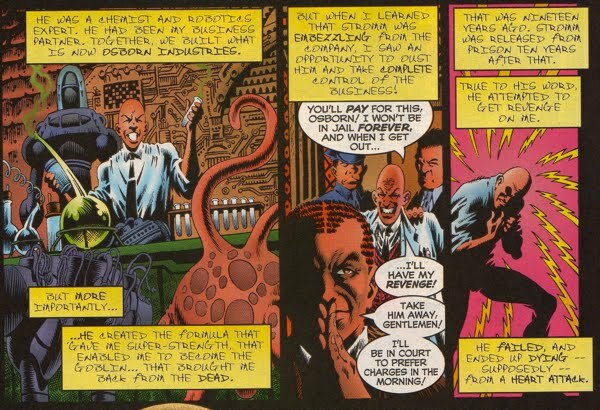 The events of Amazing Spider-Man #37 took place ten years after Stromm was arrested for embezzlement. Although it is a well-known fact (that is, it has been cited in numerous sources) Amazing Spider-Man #415 confirms the amount of time Ben Reilly spent wandering the country. This provides a reliable five-year timespan between Amazing Spider-Man #151 and Spectacular Spider-Man #216. In order to estimate timeframes between other stories, first we'll need to do some math. It'll be simple math, but we need to generate a multiplier to convert real-world years to Spiderverse years. So where does all the math leave our multiplier? ~3.2 average ratio...for simplicity sake, let's make it an even 3! Using all these data points, let's build a timeline! We know from Marvel Knights Spider-Man #12 that Norman was 55 years old at that point. 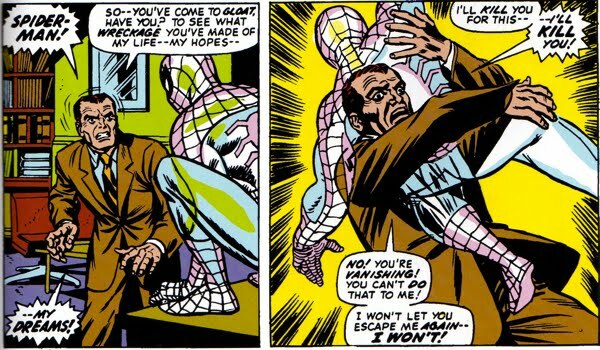 We can now estimate that Norman was 52 years old at the time of Peter Parker Spider-Man #75. Since 7 years past between Amazing Spider-Man #122 and Peter Parker Spider-Man #75, then Norman was 45 years old when Gwen died. Since 19 years past between Stromm being sent to prison and Peter Parker Spider-Man #75, then Norman was 33 years old when he framed Stromm. 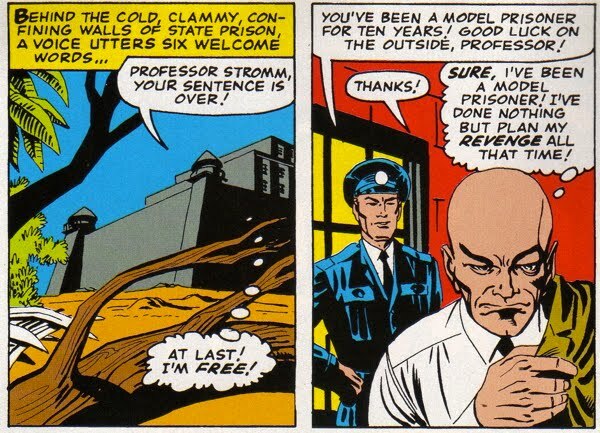 Since Stromm served a 10 year sentence, that would make Norman 43 years old in Amazing Spider-Man #37. 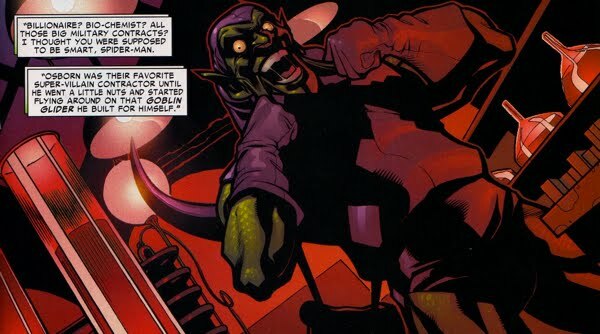 This would make Norman's debut as the Green Goblin in Amazing Spider-Man #14 around the time he was about 42 years old. 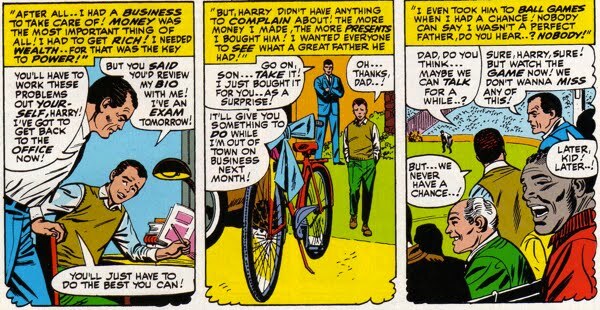 We can surmise that Harry (since he was a first-year college student at the time) was about 19 years old during Amazing Spider-Man #37. This would make Norman about 24 years old when Harry was born. 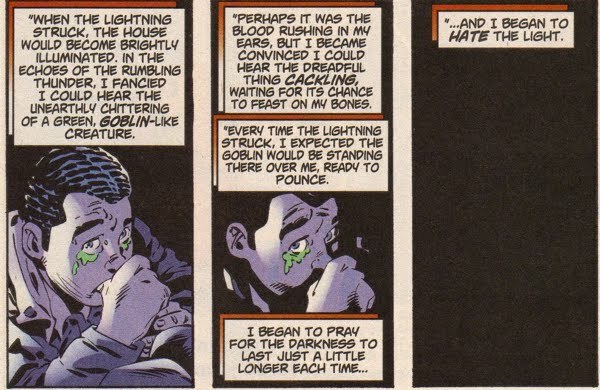 We know that Emily died about 1 year after Harry was born (as stated in Revenge of the Green Goblin #1), that would make Norman roughly 25 years old when Emily Osborn died. Norman had most likely not yet amassed his great fortune during the early years of his marriage, so we would assume that between the ages of 25 and 33 Norman formed Osborn Industries with Stromm and became very wealthy in the process. He also raised Harry as a single father during that timeframe. So I'm going to make the speculation that three years passed between Stromm's being sent to prison and Peter Parker Spider-Man #(-1), that would make Norman 36 at the time of that story. This can be (somewhat) verified by estimating Peter Parker's age around the time of Peter Parker Spider-Man #(-1), assuming that Peter and Harry are relatively close in age. 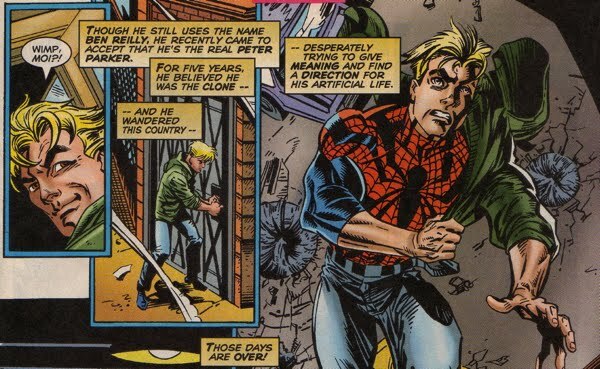 If Norman was 36 around that time, then Peter would be between 11-12 years old, which seems like a reasonable guess from the depiction of Peter in Peter Parker Spider-Man #(-1). 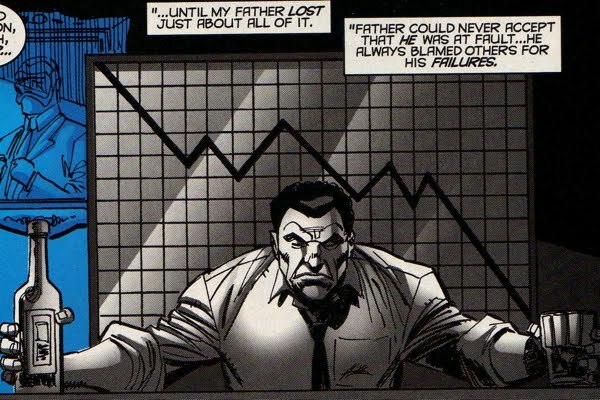 And even though at the conclusion of Peter Parker Spider-Man #(-1) Norman had located hidden formulas in Stromm's shattered desk (as seen below), we have to assume that he still continued to struggle in repeating Stromm's work. The reason for that assumption is two-fold. First, Norman never successfully recreated Stromm's formula, the formula that created the Green Goblin was discovered by accident (that's why it blew up in his face!) and Norman even explicitly states that he and Stromm had been exposed to different (albeit somewhat similar) formulas. 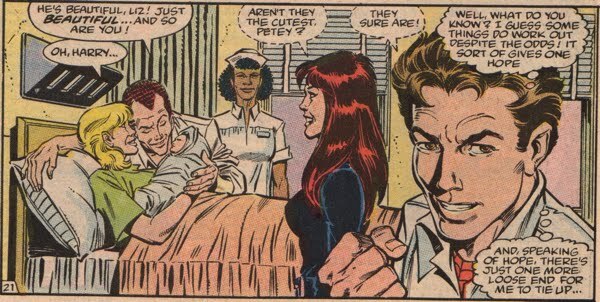 The second reason for that assumption comes from this panel in Amazing Spider-Man #39, at a time when Norman was roughly 43 years old. Harry describes Norman's change in demeanor having a occurred 'a few years ago'. First, we'll have to assume that this change in behavior is due to Norman's exposure to the Green Goblin Formula, which is a relatively safe assumption. Even though one could make an argument that Norman has been a shrewd a-hole his entire life. Moreover, the problem is that 'a few years' is difficult to quantify, it could describe anywhere from 3 to 6 years, so for the sake of this discussion let's assume 'a few' equals 4 years. If Norman was 43 during Amazing Spider-Man #39, then 'a few years ago' he would be about 39 years old. My speculation is that even though Norman was probably around 36 years old when he found Stromm's hidden notes in Peter Parker Spider-Man #(-1), the infamous explosion that created the Green Goblin most likely did not occur for another 3 years, when Norman was 39! Okay, so with a few reliable sources and some speculation, let's put it all together in the form of a Norman Osborn/Green Goblin Timeline! Norman = 0 years old. Norman is born to Mr. and Mrs. Amberson Osborn. Norman = 4 years old (this age is purely speculative because there is no way of knowing exactly how old he was, but looking at the panels from Spectacular Spider-Man Annual #14 it appears to be a reasonable guess). Amberson loses a great deal of the family fortune after his 'invention' is stolen. Norman kills the family dog in response to the upsetting news. 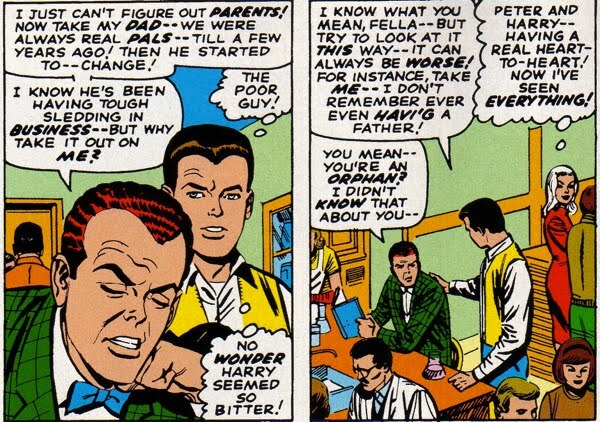 Norman = 7-8 years old (again, this age is purely speculative because there is no way of knowing exactly how old he is, but looking at the panels from Peter Parker Spider-Man V2 #25 it appears to be a reasonable guess). Amberson forces his son to face the darkness and become a man. Mission successful? Norman = 24 years old. 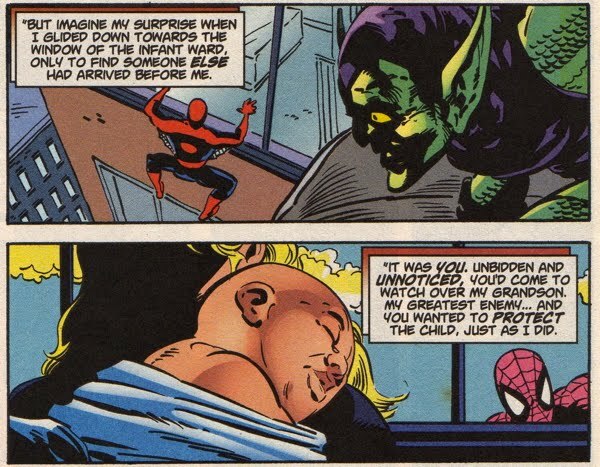 Harry Theopolis Osborn is born. Norman = 25 years old. Emily dies before Harry turns one year old. Norman = 25-33 years old. Norman formed Osborn Industries with Stromm and became very wealthy in the process. He also raised Harry as a single father during that timeframe. Norman did not hesitate to provide Harry with material gifts, but he was emotionally unavailable for his son. Norman = 33 years old. Norman turns Stromm over to authorities for embezzlement and seizes complete control over Osborn Industries and all of its intellectual property. Norman = 36 years old. 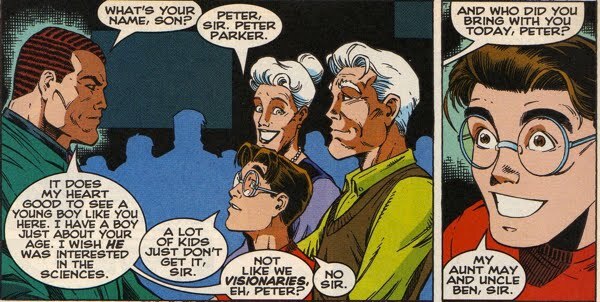 Norman meet's Peter Parker and his aunt and uncle for the first time (if we assume Peter and Harry are reasonably close in age at this point, then Peter was about 11-12 years old at this point). 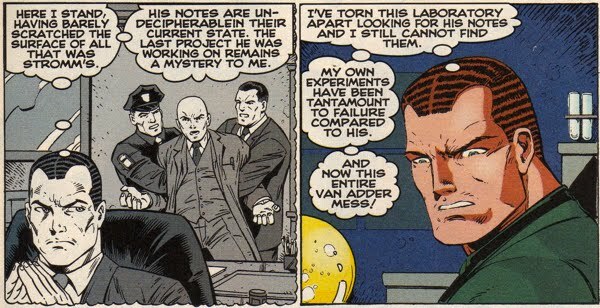 Norman also struggles to reproduce Stromm's formulas, which results in the transformation of Nels Van Adder to the Proto-Goblin. After Arthur and George Stacy protect Osborn from the vengeful Proto-Goblin, Norman discovers hidden formulas in Stromm's desk. Norman = 39 years old. As Harry recalls below, a change occurs in Norman around this time. It's odd that Harry didn't notice the correlation between his dad's change in temperament and how it coincided with the explosion that occurred in his (Norman's) private laboratory! 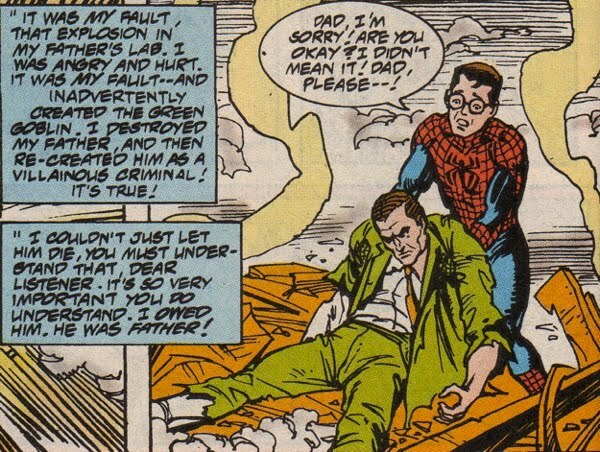 Especially since Harry's claims to have pulled his dad from the wreckage that night and Norman spent weeks in the hospital recovering from the incident. 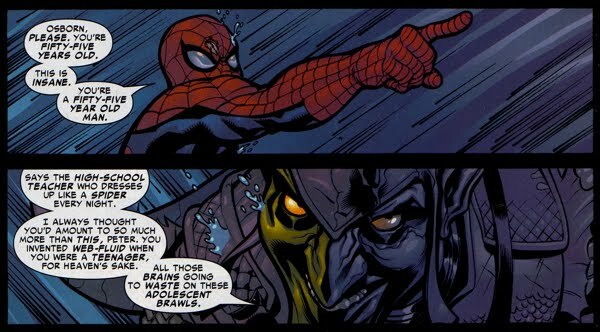 Additionally, despite the fact that Norman officially had the Green Goblin power-set by the time he was about 39 years old, he does not create the Green Goblin persona for a few more years. Norman = 39-42 years old. After his exposure to the Green Goblin Formula, Osborn takes his ruthless business tactics to the next level. 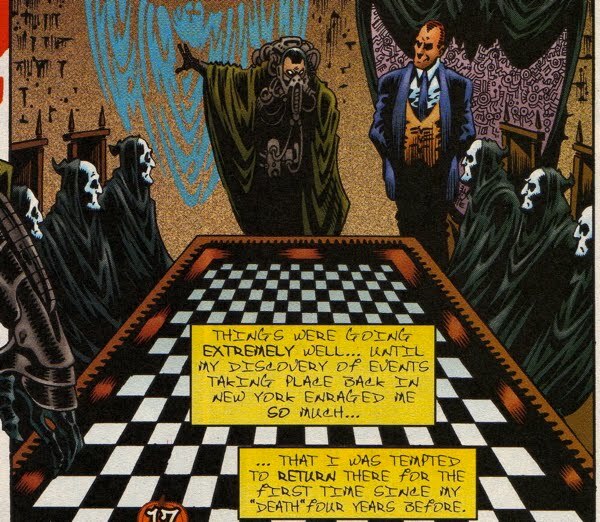 It is very likely that during this timeframe Norman made an alliance with the infamous "ruling class" Cabal first mentioned in Marvel Knights Spider-Man #9. Also Norman formed an alliance with the Enforcers who helped him to handle his run-in with the amnesiac Prince Namor. It would also be very likely that Norman was building his weapon arsenal during this time period, which led to him being extorted by Obadiah Stane (as mentioned in Thunderbolts: Reason in Madness). Norman = 42 years old. Fed up with the futile attempts by his henchmen to defeat Spider-Man/etc, Norman decides to take matters into his own hands. 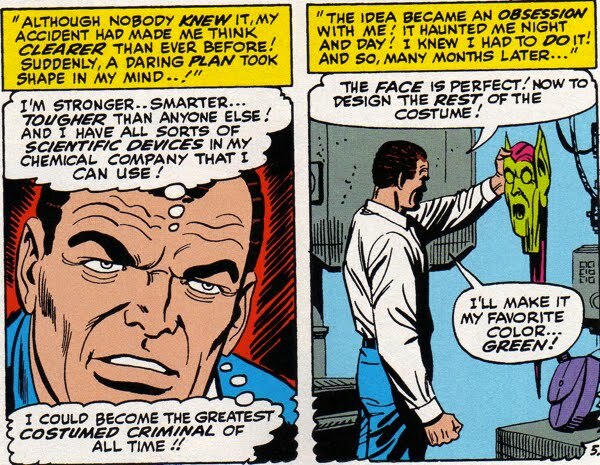 He designs a costume based off a combination of the monster that frightened him as a child (whilst 'facing the darkness' as seen in Peter Parker Spider-Man V2 #25) and, of course, his favorite color! 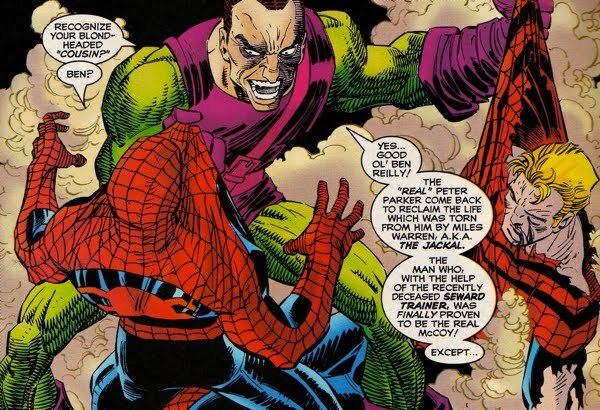 The result was the birth of the maniacal villain, the Green Goblin! Despite already employing the Enforcers as Norman Osborn, the Green Goblin recruits the team during his first outing as the Green Goblin (I guess Norman must have been pleased with their work ethic). Norman = 42-43 years old. Norman's alliance with the "ruling class" Cabal ends after they doubt his stability due to his obsession with his Green Goblin persona. Norman = 43 years old. 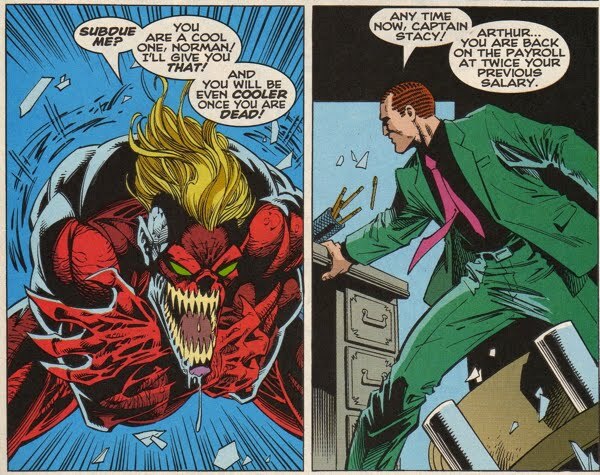 Stromm is released from prison and immediately attacks Osborn. Norman = 45 years old. 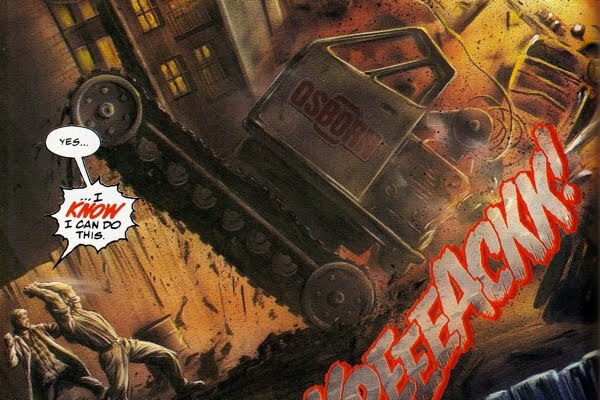 A combination of Harry's drug relapse and Osborn Industries loss in market value drive Osborn to once again relapse into his Green Goblin persona. 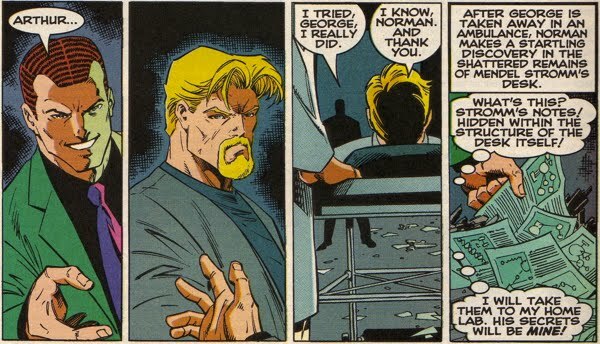 Norman's rampage results in the death of Gwen Stacy as well as his own 'death'. Norman = 49 years old. 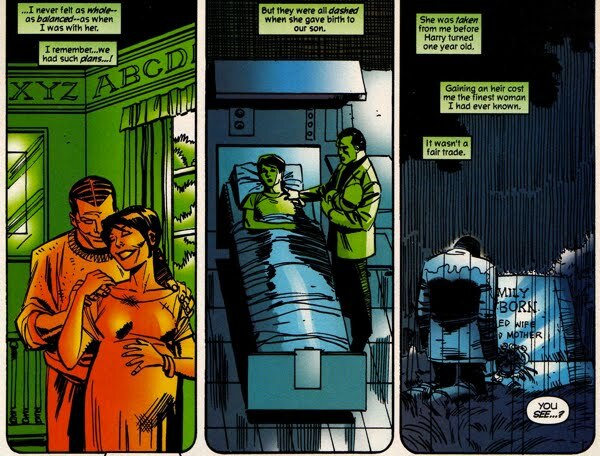 Liz Allan gives birth to Harry's son, Norman 'Normie' Osborn, an event that grandfather Norman claims to have briefly returned from exile to witness. Ironically the birth of Normie brought Norman closer to Peter as he was touched to see him (Peter) keeping a watchful eye on the newborn. Norman = 52 years old. Norman returns from his European exile and reveals himself as the mastermind behind the Clone Saga debacle. 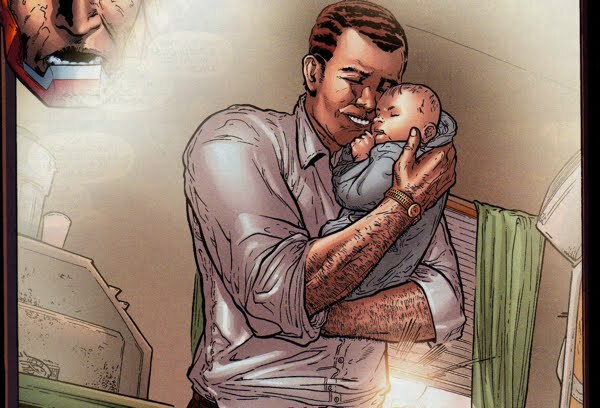 Norman kills Ben Reilly and 'abducts' Peter's newborn daughter, Baby May. Norman = 55 years old. Norman uses Peter to help him escape prison, he also kidnaps Peter's Aunt May (nearly killing her) and forms the Sinister Twelve.